When you’re stuffed to the point of discomfort after an indulgent holiday dinner (or series of them all season long), you might be wondering what it’s going to take to feel like your healthy self again. Here, nutrition and fitness experts share advice to help you get back on track after overeating—without starving yourself or doing hours of cardio. First things first: Stop beating yourself up! “Feeling guilty doesn’t lead to healthier eating and is more often associated with perpetuating emotional and binge eating behaviors,” says Torey Jones Armul, RDN, National Spokesperson for the Academy of Nutrition and Dietetics. You can’t go backward: Tell yourself you’ll start making healthier decisions starting right now. This can aid digestion and possibly help decrease the fat your body stores, says Marta Montenegro, exercise physiologist and nutrition specialist. One study showed that when subjects took a light walk after a high-fat meal, they decreased their post-meal triglyceride concentration (the type of fat your body stores to use for energy) by around 70 percent compared to the non-walking group. Note the damage, but don’t let it define you. If stepping on the scale the day after Thanksgiving will help you get back on track with a healthier eating mindset, then do it, but don’t assume the scale shows true weight gain. It may be up a few notches, but that just reflects water retention, says Molly Morgan, RD, author of Skinny-Size It. There are 3,500 calories in a pound, so to have actually gained three or four pounds, you would’ve had to consume more than 10,500 to 14,000 extra calories! 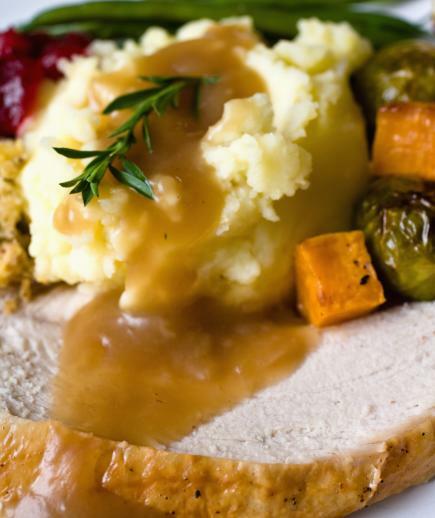 Even though our experts and other sources estimate the average American might take in 2,000 to 4,500 calories over the course of Thanksgiving day eating, that still only adds up to about a pound at the most. “Increase your fluid intake for the next few days to help flush out the extra water,” Morgan says. If you overdid the calories at one meal, keep the next meal lighter, but still satisfying by filling it halfway with vegetables, says Erin Palinski-Wade, RD, CDE, author of Belly Fat Diet For Dummies. Then fill out the remainder of the plate with lean protein options. Track your calories for the next few days. Record your food intake on a smartphone app (like Lose It! or MyFitnessPal) or with pen and paper for a couple of days to get back to your eating routine, suggests Morgan. One study showed that self-monitoring consistently during the holiday season helped the study participants minimize weight gain. Calm your stressed system with yoga. Your body is under stress after a big meal, says Montenegro. Yoga can help by activating the parasympathetic nervous system, the one that lowers blood pressure, heart rate, and relaxes the stomach nerves. Doing yoga has also been shown to increase the response of feel-good neurochemicals like serotonin and the oxytocin hormone, so you’ll feel happier, more relaxed, and ready to move on with your healthy goals after this particular overeating session. In one study, Iyengar style yoga helped reduce Irritable Bowel Syndrome symptoms, such as abdominal pain, fatigue, constipation, and other digestive issues. Read the full article on RealSimple.com.